Could a seat belt have saved Diana? 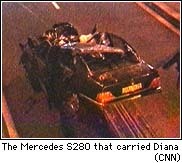 DETROIT (CNN) -- The car in which Princess Diana and two others died last Sunday showed stark and massive damage. While it's still not clear whether the victims were wearing seat belts, would that have mattered in such a ferocious crash? A computer simulation of the accident done for CNN by Renfroe Engineering in Farmington, Arkansas, shows that seat belts may have indeed turned the fatal crash into one that was survivable. The car in which Princess Diana and her party were riding, a Mercedes S280, is believed to have struck a concrete post in a tunnel, bounced off the opposite tunnel wall and come to rest after turning 180 degrees. Its estimated speed is anywhere from 70 to 100 miles per hour. The computer simulation shows that without seat belts, both the head and chest of a person sitting in the right rear seat -- where Diana sat -- would have hit the back of the front seat with great force. The acceleration that would have been experienced by the chest would have been about 70 times the force of gravity (70 g's), or about seven times what a fighter pilot experiences. The head would have experienced acceleration about 100 times the force of gravity. Princess Diana experienced chest injuries, including a torn pulmonary artery that led to cardiac arrest. "The chest acceleration is what causes the ... pulmonary artery to rip," said David Renfroe, a computer crash analyst. "Those kinds of accelerations of 70 g's will tear that." On the other hand, if a person in that same position in the same accident is wearing a seat belt, the force hitting the head drops to 30 g's and the chest force to 35 g's. "Those are both very survivable kinds of impacts," Renfroe said, predicting that the back seat passengers might have suffered, at worst, some broken ribs or a broken sternum -- nothing life threatening. But before any definitive conclusions can be drawn about whether the accident could have been survivable, more must be known about the Mercedes involved in the crash, according to auto safety expert Ralph Hoar. Hoar says because the vehicle isn't sold in the United States, experts here would not know for sure how the Mercedes would crumple in a crash, which would make it difficult to judge survivability.